Copenhagen’s food has gone from being unexciting, sometimes called bland, to an explosion of Michelin-starred restaurants. Now known as the Scandinavian gastro-capital, the city boasts 20 Michelin Stars shared between 16 restaurants. Ranging from eateries serving innovative menus using locally sourced ingredients, to up-market chic and slick internationally styled restaurants, there is something here to suit every palate. Accommodation in Denmark’s capital is also not to be sneezed at. From the top-class Hotel d’Angleterre, consistently posting the best reviews, to clean and comfortable bed and breakfasts offering home comforts, your choice is just a click away. 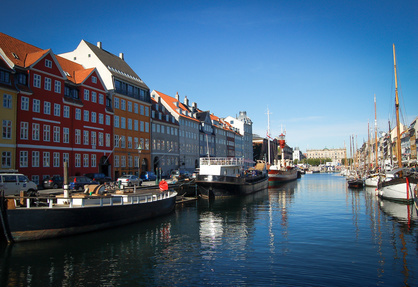 Have a look at the best hotel deals you can find in Copenhagen and then enjoy a culinary tour of the city through its top restaurants. The restaurant taking pride of place is Noma, voted the world’s best restaurant in 2010 and 2011, proving that Danish cuisine came to the fore amongst food critics, and has continually evolved since then. This two Michelin Star venue serves Nordic delicacies in a seasonal 18-course extravaganza, pairing their unique herb and apple juice, or your wine of choice, with exquisite local produce. Favourites include grilled baby corn with cured egg yolk, sea urchin and hazelnuts, and mahogany clam. The food comes from a variety of local sources, farms, beaches, forests, and the sea. Bookings must be made at least 3 months in advance, and Noma will decide on the exact day. The online application is limited to 10 minutes before you are locked out. A confirmation email will arrive in a couple of minutes. Specialising in Nordic food prepared in classic but innovative French cuisine, the minimalist but elegant Nordic architecture makes this a cosy, comfortable retreat, seating only 10 – 34 pax. With no a la carte or tasting menu, their offering changes every 2 weeks and the produce is seasonal. Around 20 different dishes of the same size, including desserts, are all the same price and are all starter size, thus offering the chance to savour their delicious variety of tastes. The meltingly delicious flavours are carefully balanced, so it is no surprise to discover that this is a Michelin-starred eatery. The presentation is exemplary and the service is of the highest standard. Topping the list with 3 Michelin Stars, Geranium is a light and airy restaurant along classical lines. Located in the perfect serenity of Kongens Have (the King’s Garden), this is one of Denmark’s finest. Run by the famous Rasmus Kofoed, who has won first, second and third places in Bocuse d’Or in different years, his vast experience spills over into the highest quality food, organic and biodynamic produce combining to produce gastronomic perfection. Situated on a former vineyard, once the home of Hans Christian Anderson, and named after King Hans, this is the oldest building in Copenhagen. Literally translated, meaning eat eat, this Thai restaurant, one of the few outside Asia to be awarded a coveted Michelin Star, was the brainchild of Henrik Yde Anderson, a previous resident of Thailand. So, next time you are in Copenhagen make a point of booking at some, if not all, of these fantastic restaurants. And experience their mouth-watering food. You won’t be sorry.